Last week, Government has given green signal to Sovereign Gold Bond Scheme and Gold Monetization Scheme. Both these schemes were introduced in Budget 2015-16 and were highly anticipated. I have already elaborated both the Schemes in different article which you can read at Gold Monetization Scheme may not be beneficial for you and Sovereign Gold Bond Scheme may prove another successful scheme of NDA Regime. In this article, I would be highlighting the difference between Sovereign Gold Bond Scheme and Gold ETF (Exchange Traded Funds) to assist you in making the investment decision. Sovereign Gold Bond Scheme is an indirect investment route into Gold. Rather than buying Physical Gold investors can now invest in gold in a paper form through Sovereign Gold Bond Scheme. Under this scheme, an investor will be given the bond of the amount s/he wishes to invest in gold. This bond will be issued in Indian Rupee like Rs.1,00,000 etc. and in various denominations by Reserve Bank of India (RBI) on behalf of Indian Government and will be distributed by Banks, Brokers and Post-Offices. Since the Bond is backed by Government/Sovereign thus the safety does not comes into question. The value of bond is directly linked to International Gold prices. The maximum investment one can make in one fiscal year is capped at 500 grams with a lock-in-period of 5-7 years. The bonds will be issued in Rupee in various denominations equivalent to value of gold of 5, 10, 50 and 100 gram. Apart from capital appreciation, the gold bond will also fetch interest @ 2% (approx.) which shall be payable in terms of Gold. In addition to this interest, there would be no additional cost like expense ratio Gold ETF. Overall the rate of return comes to 3% per annum which shall be payable in terms of gold and calculated at the year end. Gold ETF (Exchange Traded Fund) is a mutual fund linked to Gold and traded on the stock exchanges like a single stock of any company. The approx. 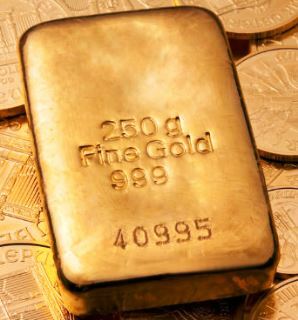 value (NAV) of one unit of Gold ETF is equal to one gram of gold of 0.995 purity which keeps changing with gold prices. Few stock exchanges gives option to redeem the units into physical gold but only after fulfilling certain specified limit such as minimum holding should be atleast 1 kg etc. The major advantage of Gold ETF is than one can accumulate gold in smaller quantities without even worrying for storage cost or robbery. Gold ETFs comes with some cost like brokerage and expense ratio which reduces from your investment amount. For example the value of 1 gram of gold on 15th September is Rs.25,000 and you want to invest Rs.2 lakhs. Ideally you must get 8 units of Gold ETF but this is not the case, you would be charged with brokerage as well as expense ratio which reduces your investment amount up to 2%. As of date there are 14 listed Gold ETF on NSE. Both the schemes are linked to Gold and backed by renowned custodians thus the safety and the purity is guaranteed. But there are some major differences which makes the newly launched Sovereign Gold Bond Scheme superior than Gold ETFs. Sovereign Gold Bonds are gaining much attention because of additional interest of 2% to 3% per annum on the invested amount. SGB will not only provide the capital appreciation, a nominal interest rate at 2%-3% per annum will also be given to the investor in form of Gold. This is not applicable in Gold ETF. You will only earn the difference in the amount of buying rate and selling rate i.e. only capital appreciation. No extra benefit is associated with GETF. Another benefit of investing in SGB is they don?t bear any cost i.e. no brokerage, no commission and also no expense ratio. All the cost of distribution and commission will be borne by the Government. Gold ETF bears the cost of holding demat account, commission and brokerage on buying and selling plus an expense ratio of about 1%. Taxation on SGB is levied under two heads Capital Gains and Income from Other Sources. Capital Gain tax is similar to that of physical gold i.e. short-term capital gain will be taxed at slab rate and long-term capital after 3 years will be taxed at 20% with indexation and 10% without indexation benefit. Currently Government is planning to provide some tax benefits on capital gains in the upcoming budget 2016-17. The interest income of SGB shall be taxed at applicable slab tax rate under the income from other sources. Since Gold ETF is debt-oriented mutual fund scheme, the tax is levied as non-equity funds under capital gain head i.e. Short term capital gains will be taxed at slab rate and long-term capital gains after 3 years will be taxed at 20% with indexation. SGB likely to come with a lock-in-period of 5-7 years, but can be easily bought and sold on commodity exchanges and thus will allow early exit. Similarly GETF can also be bought and sold on stock exchanges any time. SGB is a like FD which you can lien to raise loan up to a certain value of bond similar in case of physical gold but GETF does not provide you a facility of availing loan against them. SGB can be held in paper as well as dematerialize form while GETF can only be held in Dematerialized form. Thus an additional cost of demat account is also associated with GETF. 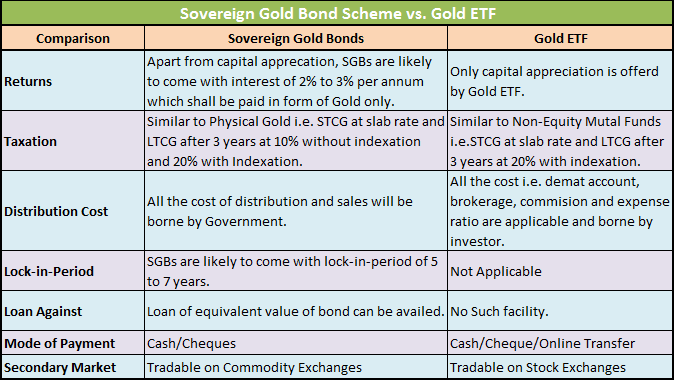 Finally, it can easily be concluded that Sovereign Gold Bond Scheme scores over Gold ETF at many occasions. Portfolio Mix: The Sheen of the Gold never fades. You portfolio must have a mix of gold with other investments up to 10%. With Sovereign Gold Bond Scheme you can accumulate gold at lesser cost with additional interest. But do remember SGBs are linked to price movement in Gold and even though the Sovereign Gold Bonds are backed by Sovereign, the returns are not guaranteed. How can I accumulate gold on regular basis? The gold bond bond has restrictive issue date, what if I want to accumulate 10 grams of gold in the month of December 2015?